The editorial position of this blog has always been that Caltrain and high-speed rail ought to be 100% interoperable, to derive the maximum transportation benefit from the considerable investment about to be made in the peninsula corridor. This creed can be summed up in a simple slogan: Any train, any track, any platform. As was previously pointed out in the discussion of platform heights, it is most likely that high-speed rail will make use of high platforms. "Any train, any track, any platform" would require Caltrain to convert its own platforms to the same height as HSR. It's one thing to gripe about platform heights, but quite another to pull off the transition without interrupting commuter service. How can it possibly be done? The end result would be a desirable center island platform for Caltrain. One could even build it such that the edge could be cut back to a gentle curvature after construction, resulting in the compact "football island" configuration when HSR is added. Another useful feature of this concept is that it lends itself to phased construction of the four-track stretches where they are most needed. Commuter trains could use the extra track capacity years before HSR enters service, achieving a level of "independent utility" that the framers of AB 3034 might be proud of. ADA regulations mandate level boarding for Caltrain's new electric trains. 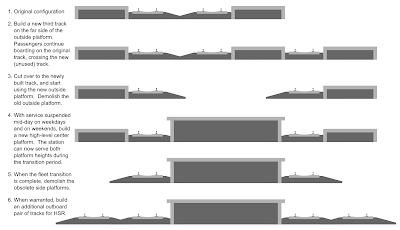 Since it is impractical to build a rail car with a floor just 8 inches above the rails, at the same height as the existing platforms, this mandate will require all platforms to be raised from their current height of 8 inches regardless of their final height, whether it be the same as HSR or something in between. 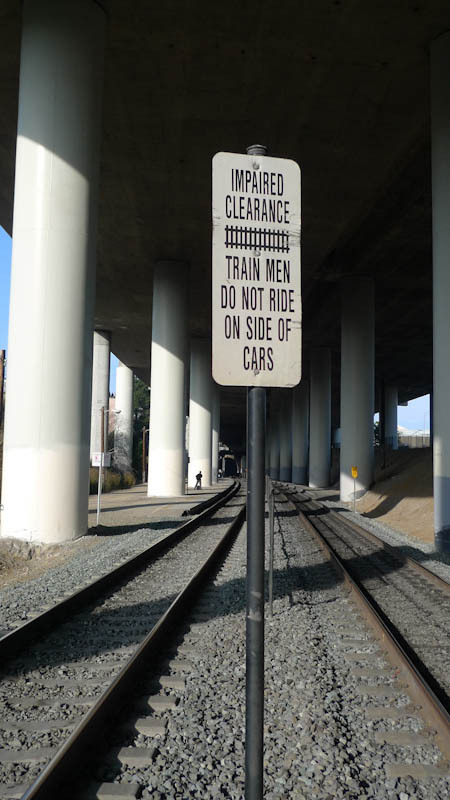 Platform edges higher than 8 inches are prohibited under the California Public Utilities Commission's General Order 26-D, which requires an ample clearance envelope to allow the outdated practice of "train men" riding on the side of freight trains. There are only two ways around 26-D: compliance by way of a complex, failure-prone and maintenance-intensive technical solution that will saddle Caltrain with endless operating and maintenance costs in order to accommodate two freight trains per day, or... a waiver. 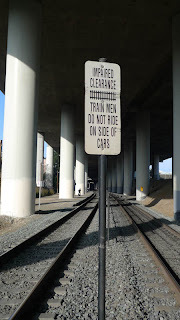 Caltrain has now demonstrated its ability to navigate bureaucracies and obtain regulatory waivers; why not obtain permission to move one sign (pictured at right) south from San Francisco to Santa Clara? The city of Mountain View recently commissioned a series of sketches depicting different grade separations options for Castro St and Rengstorff Ave. Let's take a look. First, shockingly, the tracks are configured as separate pairs, one for HSR and another for the rather aptly-named Caltrain/Freight. As will continue to be argued on this blog, and as the preliminary alternatives analysis acknowledges, this FFSS (fast-fast-slow-slow) track arrangement would force highly inconvenient single-tracking operations during service disruptions. It would also prevent commuter train overtakes. This is the worst-possible track arrangement for Caltrain. That being said, the track arrangement isn't the point of these renderings. On to the critique. The recently installed faux-depot, built for a couple of million dollars (a pittance compared to the HSR options now being weighed), appears in all the options for Castro Street. It is evidently a civic pride and joy, to be preserved at all possible costs--costs to state and federal taxpayers, and ongoing costs to pedestrian transit users attempting to circumnavigate it for access to the actual train station. 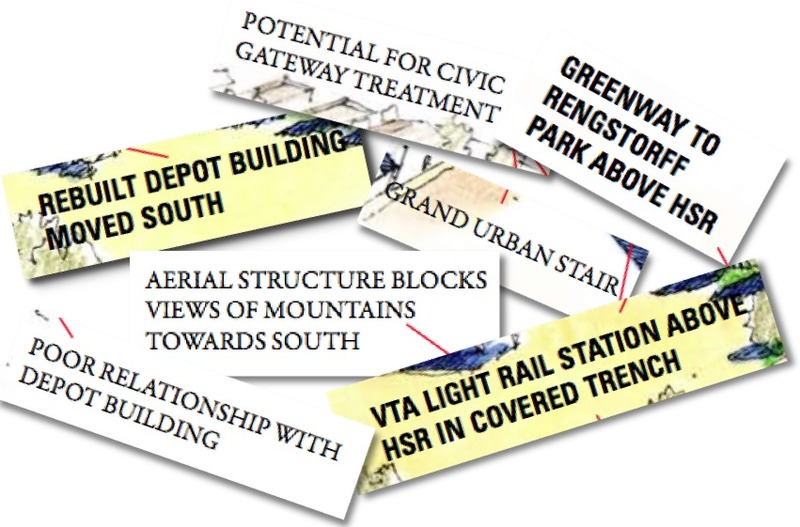 The elevated option is even dinged for "poor relationship with depot building". The Castro elevated alignment shows a rail viaduct with a full eighteen (18) feet of roadway clearance underneath, and gigantic 40-foot ornamental towers with "potential for civic gateway treatment" that dominate the landscape. The same urban design values as for the faux-depot (form over function!) are on full display. If you wanted to sand-bag the elevated option, this is clearly how you'd do it. A more functional and discreet plan would be (a) to reduce the clearance under the viaduct to a more reasonable 16 feet, which could still accommodate all manner of interstate trucking and military convoys, and (b) sink Castro by about 5 feet, with relatively minor impact to business frontage on the 100-block of Castro. This would not only reduce the hulking profile of the station, but also shorten access to the platforms. This exact "split-grade" plan was proposed in Focus on Mountain View, accompanied by a Google Earth 3D model, all free of charge. The Castro trench alignment, sure to be everybody's favorite, would literally introduce a new moat between downtown and the VTA light rail station. A nice "greenway" would be wedged in between the moat and Central Expressway, on top of the HSR tracks, for a (pleasant?) stroll to Rengstorff Park. As was previously pointed out, it is not feasible to put Caltrain/Freight into a trench at Castro and still make it back up to grade over the Stevens Creek, all the while adhering to the ultra-conservative 1% grade limitation for freight. Therefore, the trench alignment clearly suffers from some basic engineering feasibility issues, unless Mountain View has plans to grade-separate the creek as well. 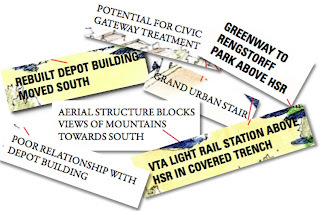 This plan, unless Mountain View pays for it, is likely a non-starter. The Castro at-grade alignment is a nice illustration of what happens when you try to build a full-depth road underpass on a dense city block. Street frontage is severely affected, with loss of parking and a labyrinth of ramps and steps for pedestrians, something that is unlikely to sit well with local businesses--assuming they can even survive the construction period, which involves extensive excavation. The VTA light rail station would be further isolated from downtown by a tower bridge, just another two convenient elevator rides away from all the action. The weakness in these renderings is that grade separation is really a continuum. 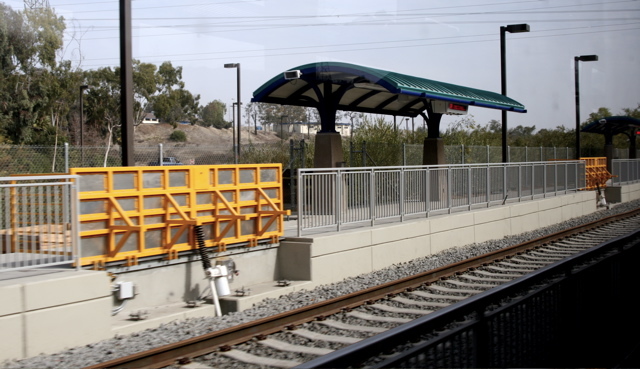 The elevated, at-grade and below-grade categories are artificially imposed on the problem to make it easier to understand, but end up obfuscating hybrid options known as "split" grade separations, where both the rails and road are altered (rather than just one or the other). These split grade separations can combine advantages of the different categories, to have your cake and eat it too. It's disappointing to see renderings that show only what the train can do to Mountain View, and not what Mountain View can do with the train. UPDATE: The city has now posted additional sketches with street-level views. Once again, the trench is made to look better than it really is; the sketch does not show the 7-foot rise at Castro Street as shown in the corresponding aerial view. 10. Improve Return on Sunk Investment. 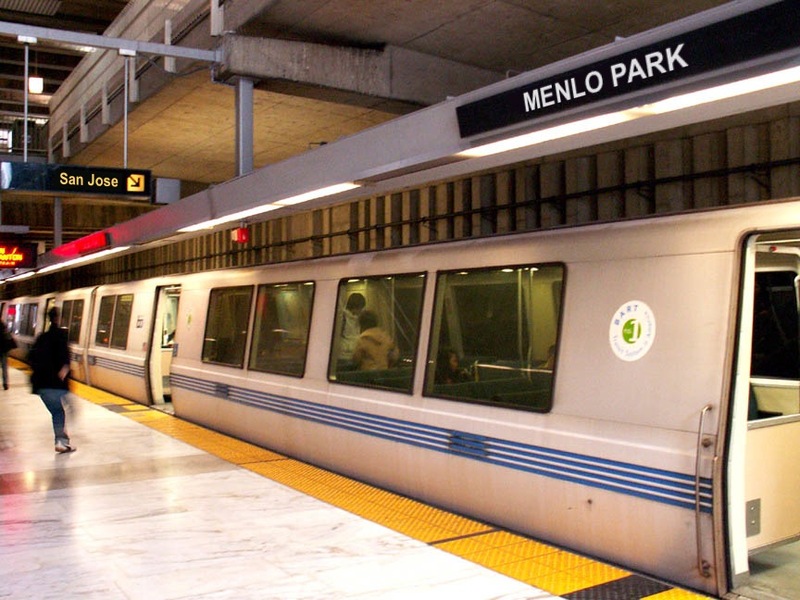 BART extensions are famous for being extremely expensive. Improving ridership by providing a seamless, transfer-free transit experience would increase the return on $1.5 billion spent to extend BART to Millbrae, and $6 billion (and counting!) about to be spent to extend BART to Milpitas, and then to San Jose and Santa Clara. Peninsula BART would provide a bit more bang for all that buck. 9. Lower Crew Staffing Costs. BART has only a single operator per train. Each Caltrain has a minimum of crew of three, with many trains staffed with a crew of four. Staffing costs account for a large portion of Caltrain's operating costs, and help explain its current predicament. While BART labor is not known for its thrift, at least train crews would be right-sized. 8. Steve Heminger Would Like It. The MTC executive director commented on the commission's recent report that the Bay Area's 28 transit agencies have too much organizational redundancy and even corridor redundancy. Who knows, maybe that's why "BART to San Jose" will really go to Santa Clara, paralleling Caltrain for nearly 3 miles. Anyhow, without Caltrain we'd be down to 27 transit agencies, and schedules and fares would be integrated with BART all the way around the Bay. 7. Shut Down For Construction. The terms of the MOU between Caltrain and the CHSRA stipulate that the peninsula corridor must be upgraded without interruption to Caltrain service. That results in amazingly complex, long and expensive nine-stage construction sequences such as depicted in the Alternatives Analysis, Appendix C, pages 41-43. Has anyone compared the cost and benefits of keeping Caltrain operating during construction? If the corridor is shut down, it can be rebuilt more quickly and cheaply, and the conversion to BART becomes straightforward. As an added bonus, there would be no need for temporary "shoofly" track detours around construction sites, reducing the need for eminent domain to acquire temporary construction easements. (a) Grade separations can be built with steep 3% grades, instead of the so-called "requirement" of 1% now being used for design. This results in grade separation structures that are shorter, more compact and slender-looking than the massive concrete required to carry massive freight trains. (b) Commuter tracks no longer require overhead electrification, with a contact wire 21 feet above the rails to clear very tall freight cars. HSR requires just 17 feet of clearance, and BART uses visually unobtrusive third-rail. (c) No more horns in the middle of the night, and a 100% guarantee that every last grade crossing will be eliminated, since BART, like HSR, requires total grade separation. Those worried about greenhouse gas emissions should note that over 50 years, 400 daily peninsula truck round-trips will add about 10,000 tonnes of CO2 to the atmosphere. Those emissions are the same as the emissions from pouring a cube of concrete just 50 feet on a side... which you can well envision would be less concrete than required to build those extra long and extra heavy freight-compatible grade separations in the first place. Bottom line: by accounting for the GHG emissions from additional concrete, it is likely that switching peninsula freight from rail to road would actually reduce overall GHG emissions. 5. Easier Tunnel Construction. With diesel trains and their toxic exhaust permanently banished from the peninsula rail corridor, an expanded selection of tunnel construction options would become available. BART itself requires a much smaller tunnel gauge, thanks to its lower speed (80 mph), low-slung third-rail electrification, and the compact loading gauge chosen to facilitate construction of the Transbay Tube. 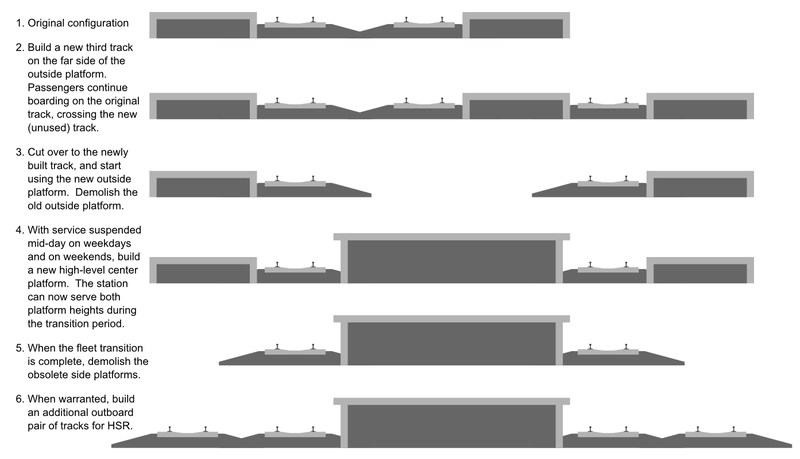 A two-track cut-and-cover tunnel (subway box) has a cross section of about 40 x 20 feet for BART, versus 60 x 35 feet, nearly triple, for Caltrain / freight. 4. Small Marginal Investment. BART is a nose-bleed expensive solution, often decried for its enormous opportunity cost. The uninformed often attribute the high cost of building BART to its non-conventional 5'6" track gauge, but gauge has very little to do with it. A significant portion of the cost of BART goes into building grade separation structures (overpasses, underpasses, viaducts, tunnels) to separate trains from auto, bicycle and pedestrian traffic. With HSR on the peninsula, 100% grade separation is already in the cards, making the marginal cost of BART much less than the usual quarter billion dollars per mile. 3. No New SF Tunnels, Plenty of Transbay Capacity. The HSR project as currently planned includes four tracks all the way into downtown San Francisco, which requires the construction of four new tunnels alongside the existing two-track Caltrain tunnels (known by the rather creative designation Tunnel 1 through Tunnel 4). Someone is bound to point out that such an enormous expense, likely several billion dollars, could be entirely avoided by tying the peninsula corridor into BART at Millbrae. The historic Bayshore Cutoff, which accounts for less than 5% of Caltrain's ridership, would become available for exclusive HSR use. San Bruno and South San Francisco already have BART stations, and Bayshore and 22nd Street are served by MUNI's 3rd street line. With Caltrain gone, HSR even gets 50% more platform space at the Transbay Transit Center. As an added bonus down south, there would be no need for an elevated HSR station at San Jose's Diridon Station, since the existing space at ground level could be converted from Caltrain to HSR use, leaving one or two tracks for UPRR, ACE and what little Amtrak service might still remain. Peninsula commuters would use the downtown San Jose BART stations instead. 2. The Strength Of An Idea. BART was always meant to expand south, and all recent extensions have been planned or built with tail tracks that are ready-made for further expansion into Caltrain's peninsula corridor. No matter what the cost, BART advocates regard the Millbrae to Santa Clara link as the final link in their manifest destiny to ring the bay. The general public falls easily for this idea--One Ring To Rule Them All. When people think of modern, fast rail service, they think of BART because that's what they've been exposed to. Never mind whether it makes any sense: it just sounds like such an obvious idea, and with Caltrain going out of business, what better time to do it than now? A partial loss of express service, due to Caltrain being confined to its own separate tracks. A Fast-Fast-Slow-Slow track arrangement that prevents effective track sharing. Rather than a shared corridor, what is emerging here is a typical PC and Mac situation: two systems that do basically the same thing in fundamentally incompatible ways. With a PC train and a Mac train, any synergy or flexibility or efficiency that might be gained through shared operations (any train, any track, any platform) is forever lost. So, why even bother? BART's broad gauge could hardly make the situation any worse. Supposing the Peninsula Rail Program wanted to do better than peninsula BART, it would pursue total operational integration of Caltrain and high-speed rail, the whole point of this blog. Any train, any track, any platform. Failing that, they are handing BART the perfect excuse to step in once shovels are in the ground for grade separations. Count on it. To be clear, this post is NOT an endorsement of BART on the peninsula--far from it. Rebuilt properly, the peninsula rail corridor has the potential to become a model of efficient and flexible transportation, with capacity and speed that BART could never touch, that would make the Swiss, Japanese and Germans nod with approval. But that will require a little bit more vision than is currently being demonstrated.